University of Nigeria Nsukka has successfully been conducting her 2016/2017 first semester examinations for students. This week has been a busy one for all first year students and staff of the School of General Studies. 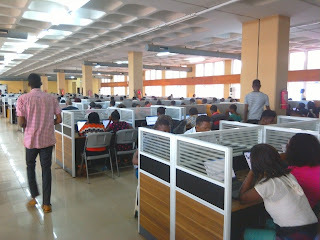 The Dean, Professor Apollonia Nwosu has expressed her satisfaction with the exams so far, thanking the University Administration led by the Vice-Chancellor – Professor Benjamin Ozumba, for providing such a wonderful platform which enables and enhances ICT usage among students and also eliminates some odds associated with examinations.